Chocolate Wine. Can it possibly work? This wine has been on offer for some time in our local supermarket, with little sign of any reduction in the number of bottles on the shelf. We instantly thought “No!” but thought we’d give it a go as a wine tasting party. This being a “chocolate lover’s wine”, we thought we should try it with some chocolate. We chose Prestat’s Dark and Rich Chocolate (71%). 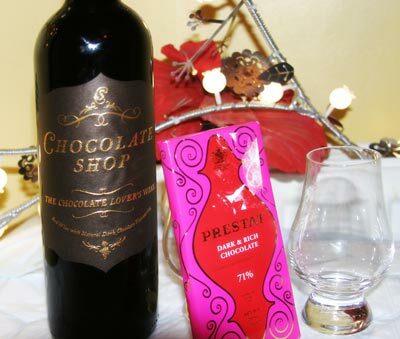 We bought Chocolate Shop’s “The Chocolate Lover’s Wine” for £5.99 in Co-op supermarket, UK, September 2012. KH took it home to see if mulling improved it.